The Life of Bon: Choose the right... kind of. Sometimes I don't know what to write on my blog. Sometimes I have to think and think and be real creative and try real hard to find something interesting enough to write about every day. Sometimes my blog posts are strained and take hours to write because I have no ideas, no inspiration, nothing of note. My blog inspiration came crashing into me at 100 mph an hour this afternoon. It might not be the kind of inspiration you think. You see, I was waiting for Relief Society to start when Michele and her hubby grabbed me and said, "Look at this! These are hilarious!" They were staring at a huge bulletin board with pictures of children. On the top of the board was the header "Choose the Right". Under each child's picture was a small piece of paper saying what that child has done to choose the right. "I helped my gramma", "I cleaned up", "I said thank you", etc. A couple of children appeared to be more devious, however. "You gotta look at this one!" Michele explained and directed my eyes to a future hood rat, no doubt. 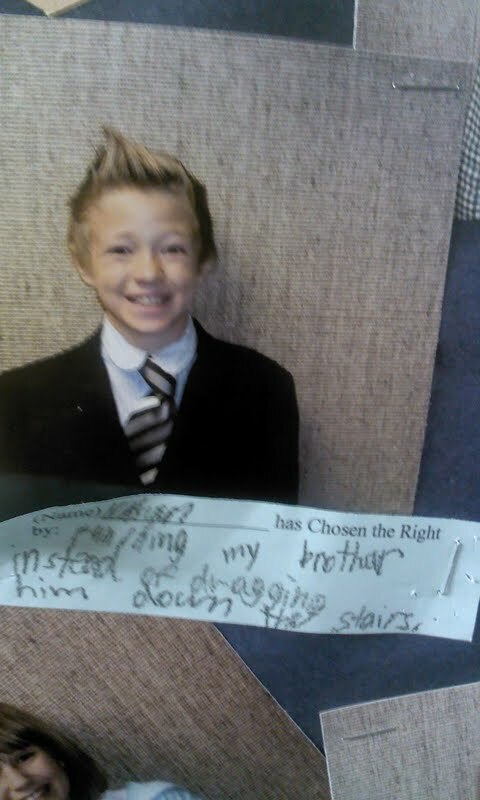 In case you can't read the writing, it reads "Nathan has chosen the right by..... Punching my brother instead of dragging him down the stairs." Then Michele's hubby exclaimed, "And look at this one!" What I saw staring back at me was the face of my very own darling nephew. 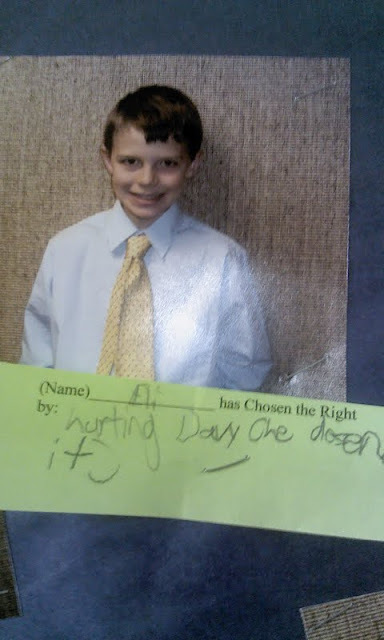 (Also the same nephew who spent $6 on cotton candy at a Jazz game, ratted out his older brother for being bossy, and ran laps around In-N-Out) My sister and her family share the church building that we meet in, so it came as no great suprise to me to see his face plastered on the bulletin board. The caption reads, "Eli has chosen the right by: hurting Davy (he deserved it)." Davy, for the record, is my other nephew. Eli's younger brother. I laughed and laughed, happily admitting to Michele and hubby that I was the proud aunt of that young buck. What I really want to know, though, is who is the teacher who approved of these messages? They had to go through some kind of screening process, right? Some kind of editing? Who is this Sunday school teacher who looked at these and said, "Yes, Eli, you did choose the right by hurting Davy! Yes, Nathan, you did choose the right by punching your brother!" It's a sick, sick world we live in, people. Speaking of sick, the Jazz lost in quadruple overtime to the Hawks tonight. QUADRUPLE! Who has even ever heard of such a thing?!?! You have quite a funny nephew there! hahha .. that is awesome! I'm not going to lie. Reading this made us laugh just as hard as we were yesterday. Hahaha..that cracks me up! I LOVE to hear/see what kids say or write. This made me belly laugh. Kids say the dangest things. bahahaha this is great. at least they thought about it a bit. cuties. Even though these are amusing. I think whoever was organizing those notes did not instill the point the children were supposed to learn from this activity!